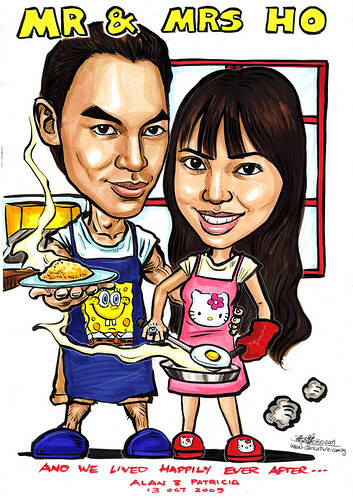 "I would like to use the style of the "Caricature theme - Chef couple". - Please draw me with long hair till almost waistline. - I will be wearing an apron as seen in attached picture but with a "Hello Kitty" face on the apron as well as on the slippers. - If possible, show a diamond ring on my finger. - My future husband to be wearing an apron as well and he will have a "sponge bob" face on the apron. - Both of us standing close to each other, can be similar to attached picture if any other posture recommendation would be fine with me. - No preference on clothes colors as long as it is bright and lively. - Background to have a homely feel. - Add the Wordings "Mr & Mrs Ho".